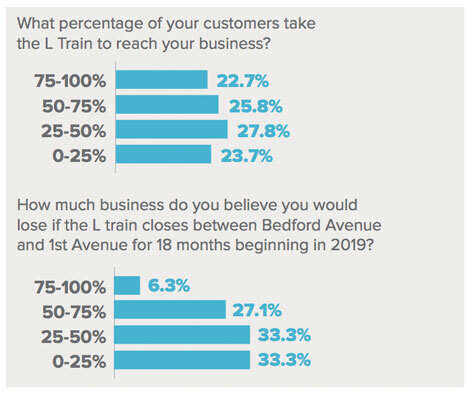 The L train shutdown is two years away and North Brooklynites are beginning to grapple with how to avoid the nightmare scenario of isolation from the transit system, shuttered businesses, and total gridlock from the Williamsburg Bridge to Queens. To avoid that doomsday, the Regional Plan Association has proposed a network of busways and bike-priority streets connecting northern Brooklyn to the Manhattan transit system. As part of that network, organizers with Transportation Alternatives are calling for a car-free “PeopleWay” on Grand Street. At the moment, Grand Street is one of three truck routes in the neighborhood, which includes hundreds of industrial businesses. But Grand Street is also used by around 20,000 bus passengers and hundreds of cyclists each day, and would give L train riders the straightest shot over the Williamsburg Bridge. It was clear from last night’s meeting that the full impact of the L shutdown has yet to register with some businesses and residents. But without the L train, Grand and other streets in the neighborhood will be gridlocked by a surge of car traffic, unless dramatic action is taken to prioritize surface transit. Doing nothing on Grand Street would not only strand current L riders, it wouldn’t make the situation any better for people making essential car trips. “If I were a business owner, frankly, I’d be more worried about losing potentially half my customer base,” he added. 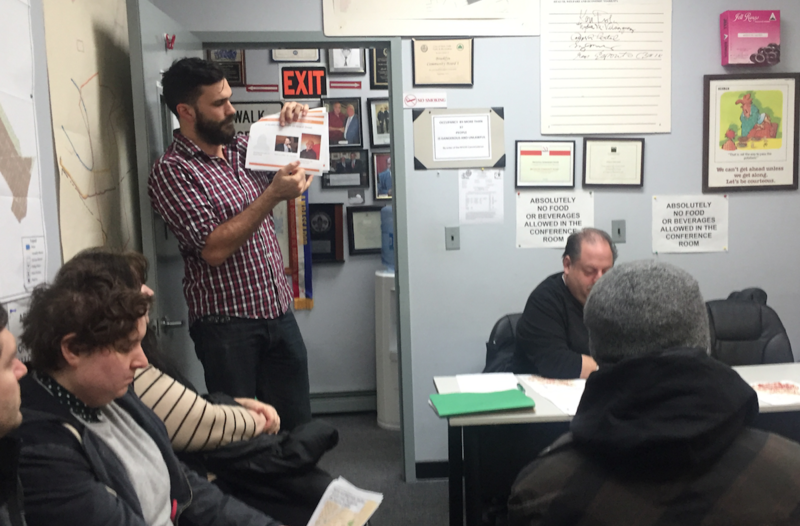 Over the summer, CB 1 requested a DOT study for a possible protected bike lane along all of Grand Street from Metropolitan Avenue to the Williamsburg Bridge. Last night transportation chair Vincent Gangone said the committee could add a PeopleWay study to that request, and invited Ohlson to present to the full board in March. I am all in favour of fundamental changes on Grand Street. But the guy expressing horror at the prospect of a 50-minute commute is just oh-so-precious. Everyone who works in Manhattan and who lives in Queens or Brooklyn outside the neighbourhoods right on the East River has a commute of at least that length. To be fair, I’m sure all the people giving their sob story why it’s crazy important that they be able to drive on that particular street are equally precious. The locksmith would provide faster service if his service techs rode bikes to their emergency calls. Transportation Alternatives is organizing a rally for the 14th Street PeopleWay at Union Square on Thursday evening. The PeopleWay concept calls for dedicating 14th Street exclusively to transit, walking, and biking.